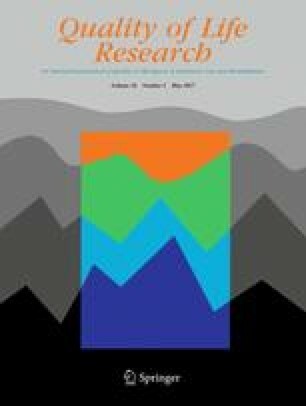 Recently, we developed a computer-adaptive test (CAT) for assessing health-related quality of life (HRQoL) in children and adolescents: the Kids-CAT. It measures five generic HRQoL dimensions. The aims of this article were (1) to present the study design and (2) to investigate its psychometric properties in a clinical setting. The Kids-CAT study is a longitudinal prospective study with eight measurements over one year at two University Medical Centers in Germany. For validating the Kids-CAT, 270 consecutive 7- to 17-year-old patients with asthma (n = 52), diabetes (n = 182) or juvenile arthritis (n = 36) answered well-established HRQoL instruments (Pediatric Quality of Life Inventory™ (PedsQL), KIDSCREEN-27) and scales measuring related constructs (e.g., social support, self-efficacy). Measurement precision, test–retest reliability, convergent and discriminant validity were investigated. The mean standard error of measurement ranged between .38 and .49 for the five dimensions, which equals a reliability between .86 and .76, respectively. The Kids-CAT measured most reliably in the lower HRQoL range. Convergent validity was supported by moderate to high correlations of the Kids-CAT dimensions with corresponding PedsQL dimensions ranging between .52 and .72. A lower correlation was found between the social dimensions of both instruments. Discriminant validity was confirmed by lower correlations with non-corresponding subscales of the PedsQL. The Kids-CAT measures pediatric HRQoL reliably, particularly in lower areas of HRQoL. Its test–retest reliability should be re-investigated in future studies. The validity of the instrument was demonstrated. Overall, results suggest that the Kids-CAT is a promising candidate for detecting psychosocial needs in chronically ill children. The online version of this article (doi: 10.1007/s11136-016-1437-9) contains supplementary material, which is available to authorized users. We thank all children, adolescents and their parents, who participated in the Kids-CAT study. We are grateful to the highly motivated study nurses Anja Bünte and Andrea Knaak and all pediatricians who contributed to the Kids-CAT project. We thank all student assistants and interns for their contributions to data entry and management. We thank the Federal Ministry of Education and Research for funding this research project. The Kids-CAT Study Group comprises: A. Bünte (Department of Pediatrics, University Medical Center Schleswig-Holstein, Campus Kiel, Arnold-Heller-Straße 3, House 9, 24105 Kiel, Germany), K. Gulau (Department of Child and Adolescent Psychiatry, Psychotherapy, and Psychosomatics, Research Unit Child Public Health, Center for Psychosocial Medicine, University Medical Center Hamburg-Eppendorf, Martinistraße 52, 20246 Hamburg, Germany), A. Knaak (Hospital for Pediatrics and Adolescent Medicine, University of Lübeck, Ratzeburger Allee 160, 23538 Lübeck, Germany), H. Muehlan (Department Health & Prevention, Ernst-Moritz-Arndt University; Robert-Blum-Straße 13, 17487 Greifswald, Germany), S. Schmidt (Department Health & Prevention, Ernst-Moritz-Arndt University; Robert-Blum-Straße 13, 17487 Greifswald, Germany) and S. v. Sengbusch (Hospital for Pediatrics and Adolescent Medicine, University of Lübeck, Ratzeburger Allee 160, 23538 Lübeck, Germany). This study was funded by the German Federal Ministry of Education and Research (grant number 0010-01GY1111). D. Barthel, C. Otto, S. Nolte, A.-K. Meyrose, F. Fischer J. Devine, O. Walter, A. Mierke, K. I. Fischer, U. Thyen, M. Klein, T. Ankermann, M. Rose, U. Ravens-Sieberer, A. Bünte, K. Gulau, A. Knaak, H. Muehlan, S. Schmidt and S. v. Sengbusch declare that they have no conflict of interest.